Edna Parker, born April 20, 1893, at her 115-birthday party in Shelbyville, Ind., on Friday. She is the oldest known person. SHELBYVILLE, Ind. -- Maybe it was a lifetime of chores on the family farm that accounts for Edna Parker's long life. 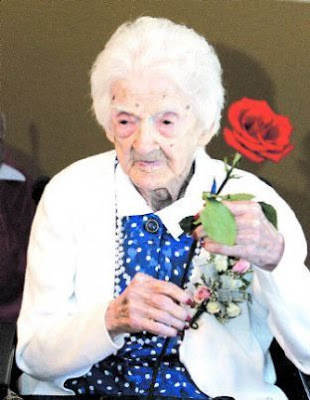 Or maybe just good genes explain why the world's oldest known person will turn 115 on Sunday, defying staggering odds. Scientists who study longevity hope supercentenarians -- Parker and others who live to 110 or beyond -- can help uncover the mystery of extreme longevity. "We don't know why she's lived so long," said Don Parker, her 59-year-old grandson. "But she's never been a worrier, and she's always been a thin person, so maybe that has something to do with it." On Friday, Parker laughed and smiled as relatives and guests released 115 balloons into sunny skies outside her nursing home. Dressed in pearls, a blue and white polka dot dress and new white shoes, she clutched a red rose during the festivities. Two years ago, researchers from the New England Centenarian Study at Boston University took a blood sample from Parker for the group's DNA database of supercentenarians. Her DNA is now preserved with DNA samples of about 100 other people who made the 110-year milestone and whose genes are being analyzed, said Dr. Tom Perls, an aging specialist who directs the project. "They're really our best bet for finding the elusive Holy Grail of our field, which are these longevity-enabling genes," he said. Sixty-four women and 11 men are 110 or older, according to the Gerontology Research Group, based in Inglewood, Calif., which verifies reports of extreme ages. Parker, who was born April 20, 1893, was recognized by Guinness World Records in August as the oldest of that group after the death of a Japanese woman four months her senior. A widow since her husband, Earl, died in 1938 of a heart attack, Parker lived alone in their farmhouse until age 100, when she moved into her son Clifford's home. She cheated death a few months later. One winter's night, Clifford and his wife returned home from a high school basketball game to find her missing. Don, their son, says he discovered his grandmother in the snowy darkness near the farm's apple orchard. He scooped up her rigid body and rushed back to the house. "She was stiff as a two-by-four. We really thought that was the end of her," he said. But Parker recovered fully, suffering only frostbitten fingertips. Fifteen years later, her room at the Heritage House Convalescent Center in Shelbyville, Ind., about 25 miles southeast of Indianapolis, is adorned with teddy bears and photos of her five grandchildren, 13 great-grandchildren and 13 great-great grandchildren. She's outlived her two sons, Clifford and Earl Jr. Her sisters, Georgia and Opal, lived to 99 and 88, respectively. So longevity seems to run in her family to some extent, but more factors must explain why she's the oldest person in the world while her sisters "only" made it to their 80s and 90s. I think it's interesting that she's resilient enough to have "cheated death" by surviving a stint of freezing in the snow. Besides her will to survive, an attitude which is widely pointed to as having beneficial effects on actual survival, it's recognized that brief environmental stressors on the body can upregulate genes that promote an efficient survival mode. Exposure to cold has been mentioned as one of these mechanisms (as are caloric restriction and intermittent fasting). I'm not suggesting that her longevity is mostly or even significantly explained by her battle with exposure, but it did remind me of research which showed a lower body temperature correlates with longer life, probably as a marker of a slower metabolism. It could be triggered by any number of factors, including a survival mechanism, I'm sure. I've also seen research proving that brief exposure to cold stimulates the immune system, which is why I take cold showers! I wonder if her body was already in survival mode, which is why she survived exposure in the first place, or if the experience further upregulated ancient feast-or-famine type genes. Or perhaps it boosted her immunity to pathogens like that which causes pneumonia, which commonly claims the elderly by preying on their weakened immunity. I'd be interested in seeing what lead to her sisters' mortality to see if it was lifestyle/weight, something influenced by not having an even-keeled attitude, or a failure of immunity. Moving on. Her story is a microcosm of many other factors we hear about time and again; we see the importance of personal independence after her husband died in the 1930s (! ), and her ability to rely on people as a support system, like when she moved in with her family as her independence deteriorated. You don't have to pop out kids or have a great family, however; research shows any type of social support is an equal or MORE effect substitute than relying on kin. Her trump card is her attitude, however. She outlived both her children and still didn't let depression and sadness rock her too hard. Me? I would have been watching a flock of red birthday balloons escape to the sky and had anxiety about pollution and the dolphins that choke on the rubber when it inevitably ends up in the sea. Then I think about the mass extinction of incredible species all due to these homo sapien parasites, progressively worsening my anxiety and attitude, and then I realize I'll probably never be a centenarian. I have no idea why that source cuts out the last section of the original article, but it goes on to consult specialist on aging research, who opines that most centenarians have both genes and lifestyle in their favor, and that one of the biggest key commonalities among all of them is that they handle stress well. They don't dwell on stressful events of the past, which can prevent all kinds of health problems: stroke, heart attacks, etc.